Thank you for your thoughts. Your skepticism does not sour my day in any way. On the contrary. I am only glad to see you take it seriously enough to bother to think critically about it. Questions and critique are necessary. I have so far only documented a few spears and axes in comparison to swords. It is reasonable that other weapons than swords may be the result of similar design methods, but I think that the "status" of the object will play a role. The more involved designs will be found in objects of higher value, status and complexity of making. There are fewer craftsmen involved in the making of a spear or an axe. There is less need for standardization. Granted, there will be some need for standards, but I am not sure that involved the same type of involved design as is needed for a sword. Arrows were made in large numbers and involved s few different groups of specialized craftsmen, but they do not carry the same heavy burden of social and symbolical power. So far I have come across a rather special looking spear head that seems to be based on geometrically derived design. It is an example of a type where there are a few other known examples and I would be very interested to know if they all share some similar design elements and proportions. -But yes, it is a very good question. I cannot answer it. I would love to know more! Peter, have you investigated to see if your hypothesis applies to post-medieval swords with compound hilts? It would be interesting to see this geometry at work in a swept hilt rapier. or a baskethilt. I was going through The Martial Arts of Renaissance Europe (Anglo) for different reasons last night and noted again how many of the post-1500 martial instructional illustrations emphasize the geometry of the fight. 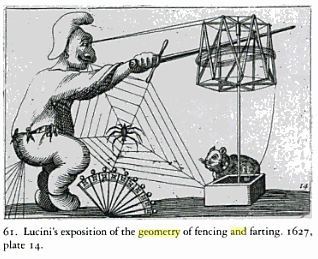 Some of it is over the top, and there's a wonderful illustration parodying the obsessive geometrization of those texts. It serves as a visual representation of Peter's warning about taking this approach to extremes, but also emphasizes the degree to which this subject occupied educated minds in the period. Defintiely. The humanistic tidal wave of the Renaissance is obsessed by "natural magic" and its principles - the metaphysical explanation of the manifestation of God as expressed through the perfection of nature - and what is simpler than geometry ? Though the image you posted seems to be a direct attack at Agrippa's sketches - and quite funny. Peter : care to tell more about that spearhead (even in private) ? I have only started to look at swept hilts. By nature they are more complex than medieval cruciform swords, and this leads to an inherently more complex geometry. This is a problem in itself, as the more complex the analysis grows, the less convincing it becomes. On a very preliminary note, I think there are some very interesting things going on that may hint at a continuation of medieval principles of design. But again, much more work is needed to be able to ay anything more than that I think it is a worth while study. The situation may be similar to what has been shown in study of architectural history: there is a continuation of methods from Gothic period to Renaissance. What changes is more surface aesthetics and less the basic principles. Just like architecture and the role of the architect changes over time came to focus more on profane work, there is a similar change in the development of the sword. It changes from being the blessed weapon of the knight, to become a status object of the wealthy burger (in very simplified terms). We may therefore see some similar principles in design carrying through from high medieval times on into the renaissance, but its application may change in some important ways: the reason geometry was used may change as times and ideas changes. Recently I was made aware of a quote from a play by Richard Brome, who was a play wright in England active in the second quarter of the 17th century (by conversation with Michael Lesiie, who is working on an edition of the play). -There’s money, sir, buy you a good one, one with the mathematical hilt, as they term it. A rare mention in period literature that by itself proves nothing. But I find it interesting. Perhaps there is more to be found once we start looking. It is after all an aspect of the sword that has not been given much attention. After finally managing to watch through the whole, I wish to thank you and the arctic fire event for putting these on the web! Perhaps of interest to you about proportional design: there is an explicitly geometrical period definition of sword proportions in Thibault (1628, so quite a bit later than your examples). I cannot say, however, whether that way of defining dimensions was widespread or used elsewhere or before. Thibault defines everything based on his geometrical construction so it's not really a surprise It is not as detailed as what you expose though; for example pommel size and blade width are not defined. About the first talk, I have my own hypothesis about the placement of pivot points (centers of oscillation) on swords, that I need to confront with more originals before describing it fully, but seems to work quite well on quality reproductions. I'm not convinced by the difference you mark between longswords and basically all the other single-handers, as fencing with all these types is not necessarily described with as stark a variation as you use here. Many longsword texts dwell on the bind blade on blade and some rapier texts explicitly advise to avoid blade contact. You expose at one point that the harmonic nodes can be associated pivot points, but you seem to have noted that this association can be more or less obvious depending on the mass distribution. I'd like to know more about that. I have a mathematical proof that harmonic nodes are always quite near to being associated pivot points whatever the mass distribution, but I have not explored beyond that. Also, are you aware that the forward pivot, aft pivot and point of balance are actually linked together, and if so do you use that correlation to make better measurements? Thibault is interesting. I know of his ideas in a general way, but I have yet to apply them in analysis. It is something I know I have to do. This naturally applies mostly on later period swords, but non the less it is one of the few examples in literature we know of that speaks about the geometry of the sword. Even in medieval times, there were an interest for the proportions of man, and how these proportions could reflect in creation and creations (works of art and engineering). I have made some preliminary attempts at finding traces of this in sword design, but again: it is at an early stage in research. What I showed as a general trend in the placing of pivot points and vibration nodes in swords of different types is based on my documentation of originals. As is always the case with swords there are exceptions. But as an image of what can generally be expected, I think it is valid. At least from what I have seen so far based on documentation and study of originals these past ten years. Pivot points, vibration nodes and point of balance all interact on some levels. I do not approach design from a mathematical perspective. I would love to learn more about the mathematical models however. Anything that brings a new perspective is very useful. My experience so far is that mathematical models tend to simplify the distribution of mass in the blade to a point where the model becomes useless for a sword smith. When I work in the smithy, it is all about very small adjustments in distal taper to fine tune how the blade itself balances and how the adding of the hilt affects the final dynamic aspects of the sword. It is fairly obvious when you know what to look for, but I can clearly see the benefit of good mathematical models for this. Especially if a sword is designed digitally, rather than being forged. On a serious note, great info! Thanks very much for sharing this. There would not happen to be a subtitled or captioned version of these lectures, would there? if/when the edited DVD comes up on netflix/itunes/amazon download, I am All. Over. This. Awesome work. 'grats to you, Dave, and everyone else involved. What I'm saying is, if a given sword itself is geometrically 'perfect', then does it by some twist of mathematics have a corresponding 'note' which conforms to the known musical harmonic scale. Sort of like a tuning fork. Not that I feel this would have any specific bearing on the swords design, but I'm just wondering if this is some sort of 'by product'. If it is possible to test a sword with perhaps an oscilloscope and see if there is any relationship, that would be interesting. I am curious to think, that if this was the case, then could it be argued that this was a necessary part of the process, ie, for the sword to essentially be 'in tune'. Now, I don't want to cloud the water here with my tree hugging, aliens abducted me, philosophical rantings. But I think its a fair and valid question. Hey Guys, thanks for your continued interest in this. -Benjamin, thank you for that download tip. Good to know for those who do not want to go to the site to see it every time. -Jeffrey, I am sorry, but there is no sub title version planned that I know of. I do know that Van Clifton is working almost night and day to get an edited version with much of the footage from the Arctic Fire event available in DVD format. I don´t think it will have sub titles, unfortunately. Perhaps an alternative would be to get the articles where I present aspects of this hypothesis on geometrically derived design? -Bruce: this is an interesting question, that the proportions of the sword will affect its dynamic properties. Sometimes I see a correlation between point of balance, pivot points and nodes with the geometrical structure that defines the proportions of the sword. I tend to think this is more a case of coincidence than a planned thing. The geometrical definitions of proportions that I analyze belong to two dimensions only. Dynamic aspects of the sword depends on distribution of mass, that is the change in volume over the length of the sword, so there is more involved than just the outline of the sword. -However, there might still be effects of these carefully adjusted proportions. More work is needed to learn bout this. Variations in volume or thickness *can* absolutely be defined with the use of geometry. The question is if they really went so far as to do that. I think the skill of the blade smith lay outside this method of definition, (but perhaps not always?). I want to learn more about how work was organized in medieval centers for sword manufacture to see how design methods may have interacted with manufacturing processes. Blades were commonly made as separate entities, to be hilted by other craftsmen. This has to be taken into account when we try to understand the process of design. It can and will affect the way the overall design is developed. Today, it is absolutely possible to plan the dynamic aspects of the sword, so that nodes and pivot points line up with the geometrical structure. It is a fun thing to play with. This idea of geometrically based deign can inspire new(?) takes on how a sword is perceived and constructed. Geometrically derived design does not by itself automatically result in a superior sword. You still have to know how a sword functions if a geometrical design method will be of any help in the planning of a sword. Sir Gawain and the Green Knight is a direct descendant of the old Norse poems which I have quoted before ... one short passage, part of the description of how Gawain armed himself before setting out on his quest, gives a key to what I want to say about chivalry; what it meant and what it did. Why the Pentangle is proper to this prince of knights. To betoken holy truth, by its intrinsic right. In all the land, I hear, the Endless knot." The Pentangle was not a regular heraldic charge, but the poet uses it here (as I do also) to symbolise the five-fold "fives" which make up the wholeness of the Chivalric ideal. The knight relies upon his own five wits and the skill of his five fingers, the five Wounds of Christ and the five Joys of Mary; and the five knightly virtues. The actual figure of the Pentangle is the most important sign in magic and is older than history; and five is the perfect number, being the marriage of the first masculine number, three, with the first feminine number, two. In one of the Gnostic systems, it is used as the only passport into the Kingdom of Light. - Sword in hand: A brief survey of the knightly sword, Ewart Oakeshott (Minneapolis, MN: Arms & Armor Inc., 2000), pp. 55-56. Hope that's of some interest! Production values look very high. I received my copy of the Arctic Fire videos. If you were tempted to get them but hadn't done so yet, I can recommend it - this is a far more enjoyable viewing experience than the online version, which was plagued by online gremlins during the live webcast. Be warned that delivery time from this distributor is notoriously long. They managed to lose my order entirely, but moved pretty quickly once I enquired. I've been amazed to see just how much detail I missed in early viewings of this ... there's so much detail and depth of information here. The Medieval Craft of Memory: An Anthology of Texts and Pictures, edited by Mary Carruthers and Jan M. Ziolkowski, referenced earlier, provides clear proof of both design and construction being done using geometry. It also makes the point that geometry was used to help with memorising, so one could both memorise a design approach using geometry and then replicate it. And so on, for many detailed pages. There's much, much more in the books I referenced earlier, but there's two of the most relevant sections - and a lead for anyone else wanting to further explore this fascinating topic. I am currently studying dynamics of Peter's Soborg diagram with 2 pairs of pivot points. it seems that the diagram may be labeled only approximate positions of those points. The CG was told to be 15.5 cm on Albion's site and 16 cm on Peter's page but the calculated position on diagram was 16.7 cm from guard front. So I adjust the CG position on the diagram according to 15.5 cm. I found that the corresponding pairs of pivot points give different Radius Of Gyration values. From Peter's video, he showed his wiggle test and I think his method and measurement were not the problem. Peter might still have the number of those points somewhere. The errors on diagram might also came from plotting. So I moved the points on blade til both pivot points pairs give the same ROG values. The diagram with modified dynamic points is attached. Unfortunately, I do not have Albion's reproduction at this moment. Could anyone else please verify the dynamic parameters for me? Thank you very much in advance. My advice is to not underestimate the measurement error with the waggle test. I'm not saying Peter has made a mistake, simply that these measurements are hard to do and that there is going to be inconsistency. This becomes quite obvious once you start measuring swords yourself. Peter's task was even harder because he was working on an antique with all the delicacy that this implies. What I do these days is re-do the measurements when I detect a consistency error. I hope one day to find the time to put up a public tool to do that consistency check. But even then it's not 100%; there is a base level of uncertainty with the waggle test that cannot be lowered except by chance. Generally I consider that I cannot get a pivot point with a precision better than one inch (in your case it's a bit more, indeed). So there is some uncertainty on the radius of gyration, you can't really get around this. Doing the test at several points as Peter did is actually very useful: it allows to estimate the precision and avoid working as if the measurements were absolutely perfect.